Even though the Summerhouses aren’t insulated you will still be lovely and cosy. 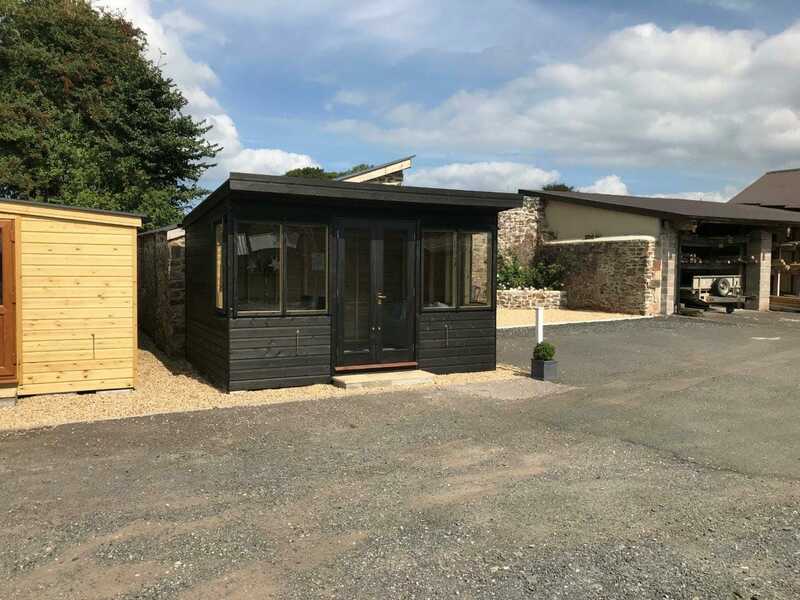 A Summerhouse is made to the same high standards as all the Shields buildings, with top grade timber, so you can be sure of a robust, well-made structure that will stand the test of time for many long summers. 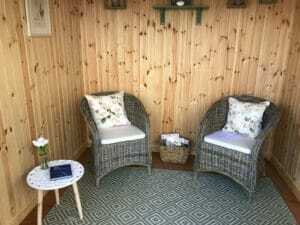 Both styles of Summerhouse, the Sidmouth and the Salcombe are on show at the display site here at North Tawton for you to see and enjoy sitting in. 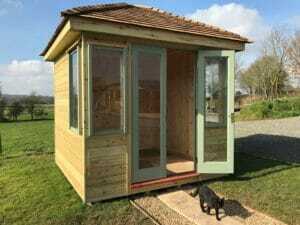 With a low profile pent roof, the Sidmouth Summerhouse ticks all the boxes. Rather than leaving it as natural wood we have stained it in Black Ash, which gives it a contemporary look, ideal for blending into your garden setting. Being unlined you can see the wood cladding interior, which gives this amazing Summerhouse a lovely rustic feel. The sheer size means you can fit in a 6-seater table and chairs along with a sofa or comfy chairs, making it an ideal space for relaxing and for entertaining – perfect for summer eating or making the most of your garden in the cooler weather. The Salcombe, by contrast, is square in shape and has an attractive natural cedar shingle pyramid roof that really draws the eye. This is a beautiful structure that will enhance any garden. You can comfortably have 2 easy chairs and a coffee table in this size. 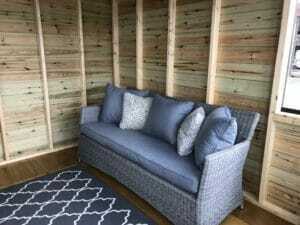 Lined with pine tongue and groove wall paneling, it offers some extra insulation and gives a truly luxurious finish with a warm feel to your garden haven. 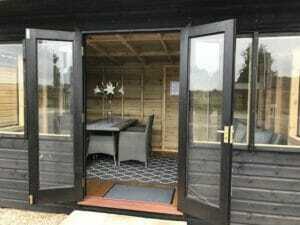 Fancy your own amazing Summerhouse? Can’t decide which one to have? Come on over to see them and chat to the team about which one to choose to make your garden even more enjoyable in the months to come.